Each year three or four people object to what we have written on this page. We can’t help it—we believe in our boats. And it’s not just because they are our boats—they became our boats because we believe in them. On several occasions, we have posed the following hypothetical situation to canoe and kayak advocates. We said, “Imagine that we erase all cultural preferences towards one type of boat or another. Then take, say, twenty of the most popular canoes, and twenty of the most popular kayaks, and a scattering of rowing boats and rowing shells. We put all the boats on the shore, and then put our three boats in the mix. We allow people to row and paddle any and all boats. And then… at the end of the day… tell them they can pick any boat and take it home—for free! The reasons we think our boats would be so often preferred fall into five categories: efficiency, safety, flexibility, carrying capacity, and ease of use. Efficiency: A customer approached us at the Miami Boat Show and said, “I can’t get any exercise from rowing your boat.” We nodded, knowing just what he was talking about. We said, “Too efficient?” He said, “Yep.” If there were two or three people in one of our boats, only one will be rowing. The others can sit there and fish, troll a hand in the water or just enjoy the day. If there are two people in a canoe or kayak, everyone is going to be paddling. Safety: All boating activities are inherently dangerous, but being in a boat that wants to stay upright puts you ahead of the game. The straight-tracking, the low profile to the wind, the long oars, and the low center of gravity all conspire to bring you home safely. AGB boats are ideal for those “On Golden Pond” moments, as well as the driving winds and waves in the ocean. The only time we have any concerns about our boats staying upright and dry is the first time the new owner gets into the boat. Step on the gunwale and you’re going to have an unhappy experience… just like a canoe. Flexibility: In an AGB boat, the owner gets a fast racing boat, a secure family boat, a long distance tripping boat, and a lovely romancing boat. A five-year-old child can row two adults in our 15-ft boat. A kayak large enough to take Mom and Dad and the kids…..would be a difficult boat to paddle alone. Carrying Capacity: Our 14-ft or 15-ft boat can take one, two or three people, or two adults and a couple of kids. They perform well if lightly loaded and perform well if heavily loaded. Ease of Use: We once showed a husband and then his wife how to row our boats. A nearby couple was being taught to paddle a kayak. The husband and then his wife each rowed perhaps one-quarter mile around the harbor. In that same amount of time, the other husband and the other wife had each separately fallen out of the kayak they were testing. We were tempted to go over and offer one of our business cards to the floundering couple….but that didn’t seem right. Our boats are rowing boats, with long, graceful oars, and our boats are sometimes paddled to get through very narrow channels. Our boats combine the virtues of a row boat and the virtues of a canoe, blending those qualities together—leaving their defects behind. Traditional row boats are stable and have great carrying capacity, but they are heavy and difficult to move, whether in or out of the water. Canoes are fast, light, and beautiful, but difficult to keep upright, and, they are a challenge to paddle in a straight line, especially in the wind. Canoe paddles are short, the longest paddle in common use being perhaps 5-ft tall. And, a canoe paddle can only be used on one side of the boat at a time. AGB boats have 7-ft or 8-ft oars, each sitting balanced on its oarlock and extending some 5-ft to 6-ft away from the boat. This gives balanced control and provides an even pull on each side of the boat. If you’ve got a hard wind, you don’t want to be out on a large lake in a canoe. 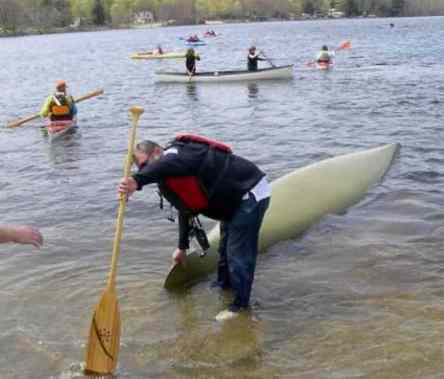 In 1998, in a 90-mile race across the Adirondacks, 81 canoes and kayaks were blown to the side of Raquette Lake by a hard wind. Thirty-four of the canoes and kayaks were flipped by the waves and all had to be rescued and towed off the lake by speedboats. Not a single guideboat required that service. 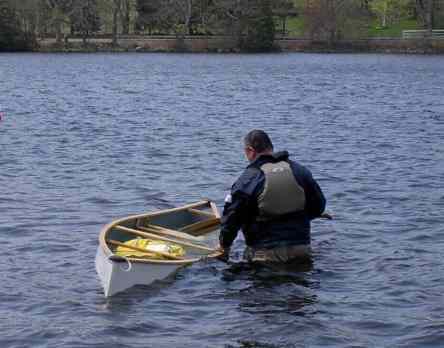 AGB boats are made for heavy water and hard wind, conditions common in the Adirondacks. If you made your livelihood from your boat, which is what the guides did, you’d better be able to get your sport (passenger) safely back to shore, with all of the gear and game intact. We have a customer who participated in a race in Boston Harbor when the race conditions were so severe that the Coast Guard removed all canoes, kayaks and Alden Ocean Shells from the water. We would have expected, under those conditions that our boat would have also been removed, but no, it was left to compete—and won its class! There are some situations in which a canoe or a kayak will out-perform a Guideboat or a Packboat. Those conditions are when whitewater is present, when agility is needed, and when straight tracking is irrelevant. On larger bodies of water, on something wider than a narrow mountain stream, or when the wind kicks up (which it always will) the canoe and many kayaks will go sideways—Guaranteed. We have friends who are world-class canoeists and canoeing instructors. We have seen them make a canoe perform as if it were part of a water ballet. But… they are world-class canoeists. Inexperienced canoeists will, on occasion, find themselves swimming. As you can see from the photo above, the wind wasn’t blowing and waves weren’t present. The canoeist was inexperienced and the boat was not at all forgiving. 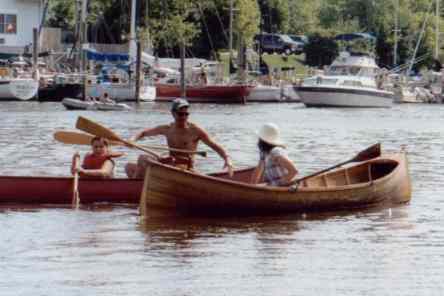 In the picture (left), notice how low Valerie is compared to the man in the canoe. She is inside the boat. He is up high, his center of gravity well above the gunwales. Even if he were kneeling in the canoe, which is recommended, while his center of gravity would be lower, he still needs to be high enough to reach over the gunwales to get his paddle into the water. When two people are paddling, their centers of gravity will both be high and their efforts will have to be coordinated to keep the boat balanced. To finish up with the amnesiac-demo-day posed above, the skeptic might say, “OK, if your boats are so superior, why are there 500,000 kayaks and 100,000 canoes sold each year but only 200 Adirondack Guideboats? The answer is culture and cost. Cultural momentum is difficult to change. Canoes and kayaks are cheap to build and offer substantial profit margins for both the manufacturer and the retailer. Guideboats are (have always been) expensive to build. Canoes and kayaks lend themselves toward mass-manufacturing processes, something just not possible with built to order AGB boats. Now with all that has been said here, we truly feel that the most important thing is being out on the water. Whether it’s a canoe or a kayak… or a rowing boat … or a raft … or an inner tube… it’s being out on the water, connecting with nature, with friends and family, that is most important. Be safe. Have fun. Don’t fight.